Tonight Pop-Diva Lady Gaga will croon for Indians at the Formula One After-Party at LAP. Now will she wear here signature Theiry Mugler ensembles or as strongly lobbied by PETA, opt for the ‘Lettuce Gown’? Gaga famously wore a meat dress at the 2010 MTV Video Music Awards. So being a Walking Salad Bar in a Lettuce Gown would do a lot of good to her image. 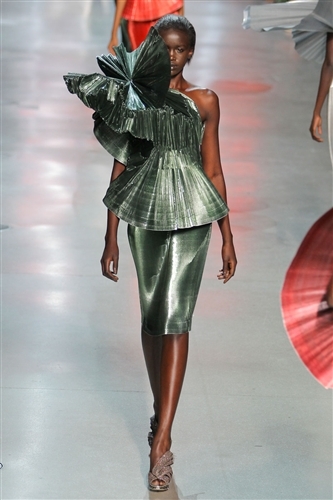 At the Paris Fashion Week Spring/Summer 2012 where Manish Arora presented his debut collection for Paco Rabanne, revered fashion scribe, Suzy Menkes wrote that Lady Gaga should look at the collection to move on from Theiry Mugler as they are full of drama that Gaga so loves. So I was rather surprised when Lady Gaga turned up in a Naeem Khan gown, explaining the designer’s India-Connect. Manish Arora would have been more apt for Gaga, both in terms of her style and her conscious effort in wearing something with a India-Connect. Naeem Khan moved to the United States and apprenticed for Halston where he absorbed the ethos of modern restraint. Now ‘RESTRAINT’ is a word that probably does not apply to Lady Gaga. 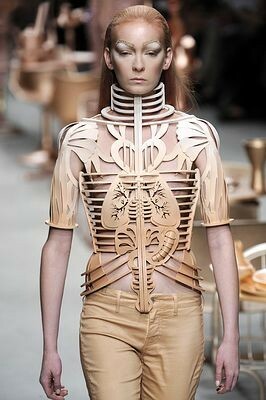 Hence I think Manish Arora would had been a better choice. Koel Purie did a coup of sorts by getting the first exclusive interview with Lady Gaga ‘On The Couch With Koel’. She gifted Gaga dressed in an Ungaro jumpsuit with jewelleries, which she procured from Gaurav Gupta and Manav Gangwani. Gangwani was smart to do that brass, studded with Swarovski piece of OM, which Lady Gaga seemed to have loved. Dilli Haat is where Lady Gaga went shopping and she was dressed in Azzedine Alaïa Fall 2011 Couture. Now can any of our Desi Fashionistas ever dream of dressing in Couture for a trip to Dilli Haat?? ?